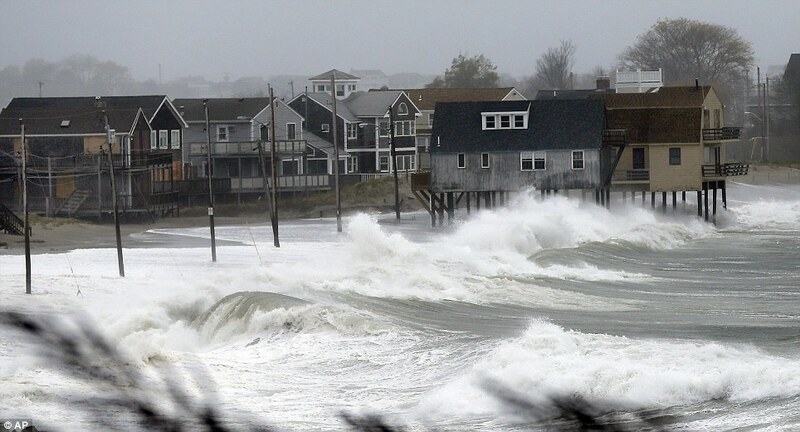 Hurricane Sandy slammed into the East Coast around 6.30pm EST last night as millions of Americans are warned it was still unsafe as the rain eases. 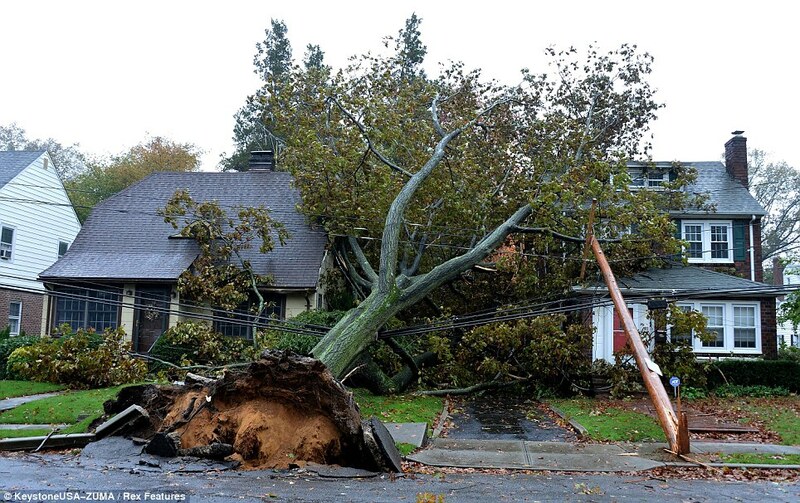 Three people were killed by falling trees as the storm lashed towns and cities. A 30-year-old man died after being hit by a tree in Queens, New York, and two more people were killed when a tree landed on their car. New York Governor Andrew Cuomo confirmed that cars were floating down flood-hit streets in Lower Manhattan. Mr Cuomo said that the 911 system was being inundated with 10,000 calls every half an hour. 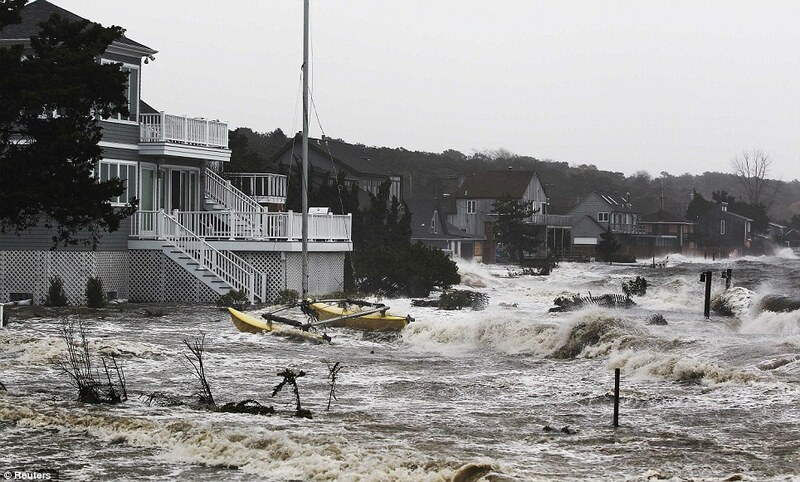 Sandy had laid waste to large parts of the coast throughout the day, leaving more than two million without power in Connecticut, Delaware, Maryland, Massachusetts, New Hampshire, New Jersey, New York, North Carolina, Rhode Island and Virginia while whole cities have been flooded and billions of dollars of damage expected. 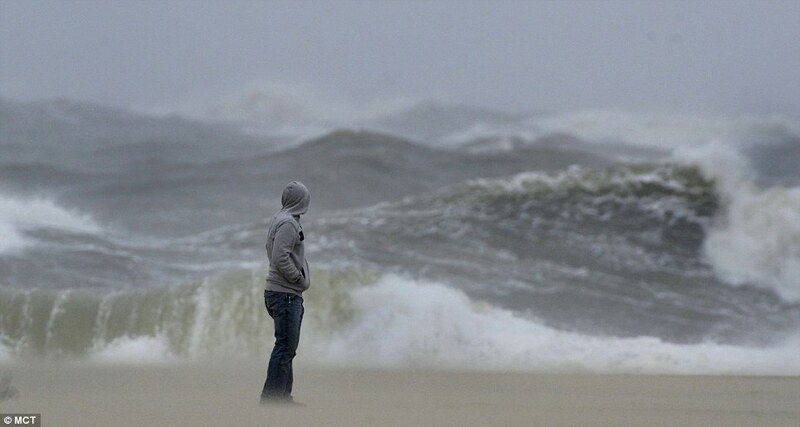 But as darkness fell, Sandy was about to make landfall at Cape May, New Jersey. Winds rose up to 90mph with fresh warnings that the 'most severe part of the storm is now beginning'. Storm surges of more than 12ft have already been recorded in Long Island, with waters rising quickly in Lower Manhattan as high tide approaches. Howling winds of 100mph have been reported on the RFK Bridge in upper Manhattan as gales were expected to last for hours. 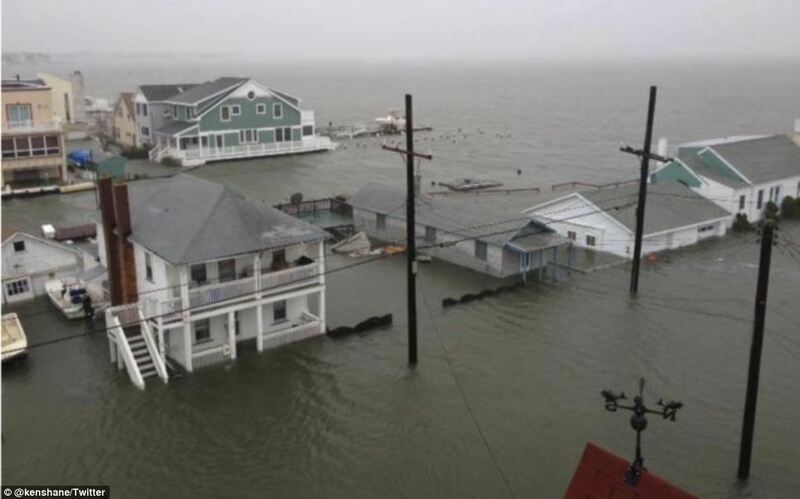 Sandy has revealed the first signs of her monstrous power, dumping snow, breaching rivers and forcing floodwaters into towns and homes across the East Coast. New York Mayor Michael Bloomberg told citizens at a 6pm press conference that: 'The most severe part of the storm is now beginning' and warned people that the time for evacuation was now over and to stay indoors, with the peak surge in the city's harbor lasting until 10.30pm (EST). Brooklyn, Manhattan, Williamsburg, RFK and Queensboro bridges in New York will shut at 7pm. Hurricane Sandy is moving slowly toward the north-northeast but is expected to turn to the north and west later Sunday and Monday, forecasters say. At some point, it's expected to become what's known as an extratropical storm. Unlike a tropical system like a hurricane, which gets its power from warm ocean waters, extratropical systems are driven by temperature contrasts in the atmosphere. Although Sandy is currently a hurricane, it's important not to focus too much on its official category or its precise path (current models show it making landfall over New Jersey or Delaware sometime early Tuesday). It's a massive system that will affect a huge swath of the eastern U.S., regardless of exactly where it hits or its precise wind speed. For example, tropical storm-force winds can be felt more than 500 miles from the storm's center, according to the National Hurricane Center. 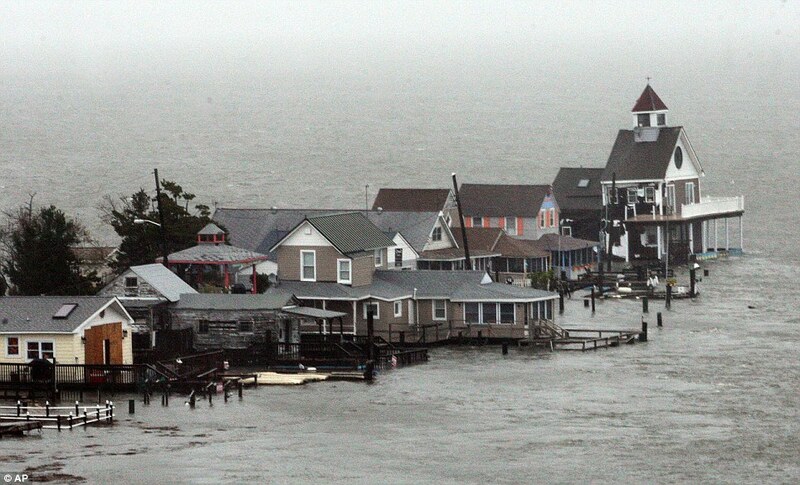 It's already caused some minor flooding in North Carolina's Outer Banks and has prompted evacuations elsewhere. The Federal Emergency Management Agency has personnel and supplies spread as far west as the Ohio River Valley, said Craig Fugate, the agency's director. Sandy is expected to merge with a wintry system from the west, at which point it will become the powerful superstorm that has forecasters and officials across the eastern U.S. Winds from that system will pull Sandy back toward the U.S. mainland. Frigid air coming south from Canada also is expected to collide with Sandy and the wintry storm from the west, creating a megastorm that is expected to park over the northeast for days. The brunt of the storm could hit areas farther inland. Officials are bracing for the worst: nearly a foot of rain, high winds and up to 2 feet of snow. Further complicating matters is the possibility for dangerous storm surges: A full moon means the tides will be higher than usual, which will make it easier for the storm's powerful winds to push water into low-lying areas. That, coupled with the threat of several inches of rain, has officials working to shore up flood defenses. Storm surge could reach anywhere from 2 to 11 feet along the northeastern coast, forecasters say. Inland river flooding also is a serious concern. Storms in recent years have left hundreds of thousands of people in the eastern U.S. without power, sometimes for days at a time. Utilities have been bringing in extra crews and lining up tree trimmers so they're prepared, and with good reason. The superstorm brings two possibilities for knocking out electricity. For one, hurricane-force winds of at 74 mph could send tree branches into power lines, or even topple entire trees and power poles. 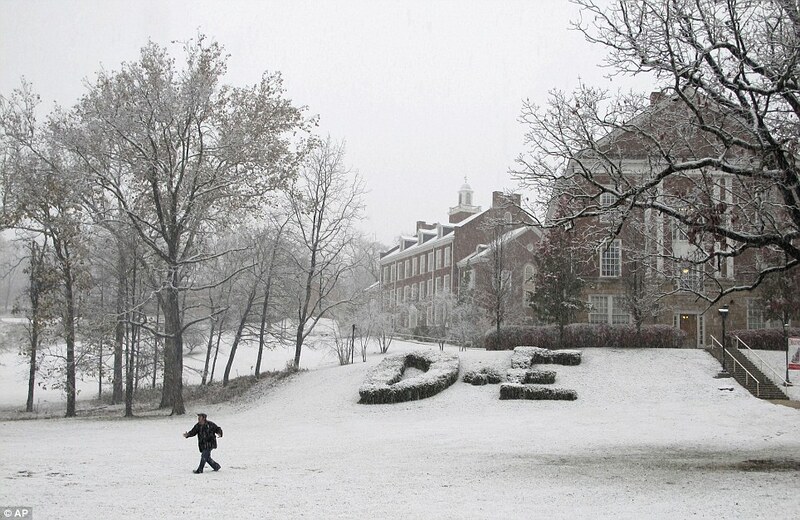 Those left standing could succumb to snow, which could weigh down still-leafy branches enough to also topple trees. Weather Advisory for Monday, October 29, 2012 5 p.m.
UPS Freight continues to monitor the impacts of Hurricane Sandy as it moves along the East Coast of the United States. As we execute contingency plans to keep our people and our customers' freight safe during the storm, we will post service updates to this site. For today, service disruptions can be expected in Delaware, Maryland, Washington D.C., New Jersey, New York, coastal and northern Virginia, West Virginia, Connecticut, Rhode Island and the eastern parts of Pennsylvania. As detailed information becomes available, we will update this list. All UPS Freight service centers in the areas impacted by Hurricane Sandy are working to protect our people and to secure customers' shipments as quickly and safely as local conditions will allow. At this time, it is important that you note that the No-Fee Guarantee may not be honored for shipments affected by Hurricane Sandy. UPS Freight is committed to making every effort to provide service to all areas where conditions permit safe access. We are closely monitoring local areas to ensure service resumes as soon as conditions permit. Severe weather due to Hurricane Sandy is causing some unavoidable service delays in Connecticut, Delaware, Maryland, Massachusetts, New Jersey, New York, Pennsylvania, Rhode Island, Virginia, and Washington, DC. No pickups, deliveries, or On Call Pickup® service are available in the ZIP Codes listed below. This includes staffed (such as UPS Customer Centers) and unstaffed retail locations (drop boxes). UPS is committed to making every effort to provide service to all areas where conditions permit safe access. We are closely monitoring local areas to ensure service resumes as soon as conditions permit. Please continue to monitor ups.com and check your package tracking for the latest delivery status information. The UPS package guarantee does not apply when transportation networks are disrupted.